The Secret Garden takes you to England this Thursday, April 5 at 4 and 6 p.m.
Bob Dylan’s songs permeate his life in I’m Not There, this Thursday, March 29 at 4 p.m. and 6 p.m.
Former Friends’ board member and avid reader Jane Hembree is busy this time of year. 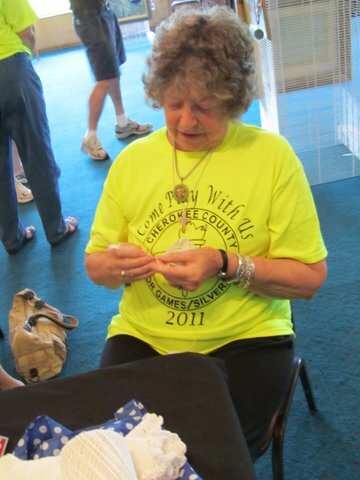 She is the Coordinator for the SilverArts in the Senior Games working alongside Jim and Sue Brent, the Co-Coordinators of the overall Senior Games in Cherokee County. Starting May 5 Cherokee County, as well as Clay County and Graham County will be having their fifth annual games at Murphy High School track field. You’d rather ride than race walk? That’s okay. They are also sponsoring a car show with special recognition to the best looking, oldest car! Participating in the Senior Games, however, as well as SilverArts, has multiple benefits. Friends' member Millie Crawford won the Gold Medal for her crochet work in the State Finals of the Senior Games SilverArts last year. Senior Games is a national organization and North Carolina is a part of that organization. It includes a wide ranging series of events for people who are 55 or better. The main purpose is to have seniors stay involved, active and creative all of our lives. Our motto here in Cherokee County is “Come Play With Us” and we hope you will. We have had participants in their nineties so you can’t blame age for not jumping in. North Carolina Senior Games is unique in that it is the only state which includes the SilverArts (one word officially!) along with a number of physical activities. Don’t miss out on such activities as swimming, race walking, football and baseball throws, discus throw, golf, bowling and this year,the state is including the Corn Toss in the competition. If you don’t know what that is, you must find out! $10! will give you full participation, a tee shirt and a wonderful meal at our closing ceremony. Now, that is a bargain in any ballpark. Included in the SilverArts are pottery, drawing, painting, carving, knitting, performance and literary to just name a FEW. The competition for the SilverArts will be held at the Mountain Vista Inn beginning May14th. Winning is not the main issue of course. Being a participant is. But IF you are a medal winner at the local level, you can advance to the state level. We have had a number of state winners. Our website is cherokeecountyseniorgames.org. Here you will find information, phone numbers,newsletters and a current application which is full of information.The state web site is ncseniorgames.org. Please check us out. 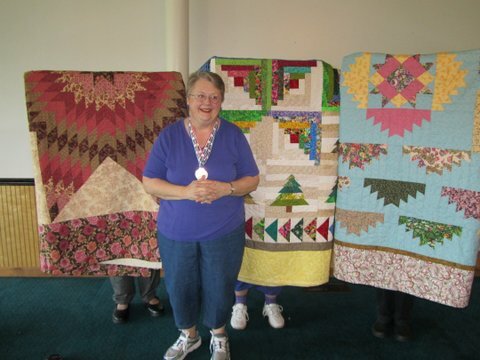 Local resident Gigi Turner won Gold, Silver and Bronze medals at the local level for the Senior Games SilverArts in quilting. I promise you will find something that interests you and that will bring you into contact with some wonderful, talented and active people. 2 Responses to "Avid reader and former Friends board member, Jane Hembree, has another special interest, the Senior Games"
Julie, this site is wonderful! I promise to check it more often. There is so much information and so many things going on. The citizens of Cherokee County are so lucky to have the library and the board members that we have. Thank you all. Thank you, also, for including the Senior Games. I do have one BIG change. I am not the Coordinator of the Senior Games, just the SilverArts. Jim Bent and his wife Sue are the Co-Coordinators of the overall Senior Games in the county. And, to top even that, Sue is on the State Board of the North Carolina Senior Games as the State Coordinator of the SilverArts. We are so proud to have one of our own with such an important position. Again, please do come and play with us.